BROOKLYN, NY, UNITED STATES, June 27, 2018 /EINPresswire.com/ -- Shema Kolainu - Hear Our Voices, held another successful workshop regarding Oral Motor and Feeding Therapy at Touro College in Manhattan. The workshop was presented by Dina Ezagui, CCC-SLP, a speech pathologist from Brooklyn with over ten years of experience with children who have autism. It was attended by parents, teachers, and speech therapists from all five boroughs. Attendees were shown the different feeding challenges children with autism could have, and were presented with suggestions and demonstrations that can help improve and even overcome those challenges. Throughout the workshop, Ms. Ezagui answered many questions the audience had. Parents asked personal questions about what their child is experiencing. A mother with a ten year old autistic son indicated that he eats the same textured food and is trying to ease him into a new flavor. Ms. Ezagui assisted her in tips for her to use with her son in the future. Shema Kolainu - Hear Our Voices, a School and Center for Children with Autism, with Dr. Joshua Weinstein - Ph.D., M.B.A., CEO & Founder, is a leader in the field of special education. 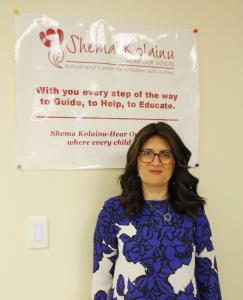 For 20 years, Shema Kolainu has serviced the disabilities community in New York City with educational services and the SKHOV workshop series is a great opportunity to gain knowledge from some of the best resources in the field of autism. As a model school and center, SKHOV is a training center for educators and administrators nationally and internationally. Recognizing the urgent need and high demand for autism resources, Suri Gruen - Program Director and Gili Rechany, Educational Director, organized and executed SKHOV free autism workshops. 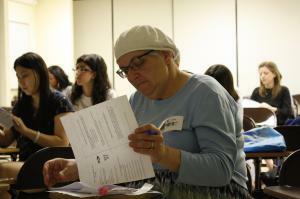 This past year the workshops were attended by hundreds of people and have proven to be very successful. SKHOV thanks the New York City Council Autism Initiative for making this possible by providing the necessary funds for this program. Our free autism workshop series will resume in November 2018. To view previous workshops, please visit us at shemakolainu.org.